Don’t heat up the house for dinner! You can enjoy some of the juiciest chicken around when you follow these tips for How to Grill a Whole Chicken. If you’ve never been to Minnesota in June, you’re missing out; we really know how to summer. Part of that is out of necessity as it is inevitably our shortest season. Our time and efforts are solely focused on squeezing every last minute out of our warm weather as possible. We take everything outside, especially our meals. You’ll find us eating al fresco more than not, and the grill is always on, churning out all sorts of goodies from appetizers to desserts to everything in-between. 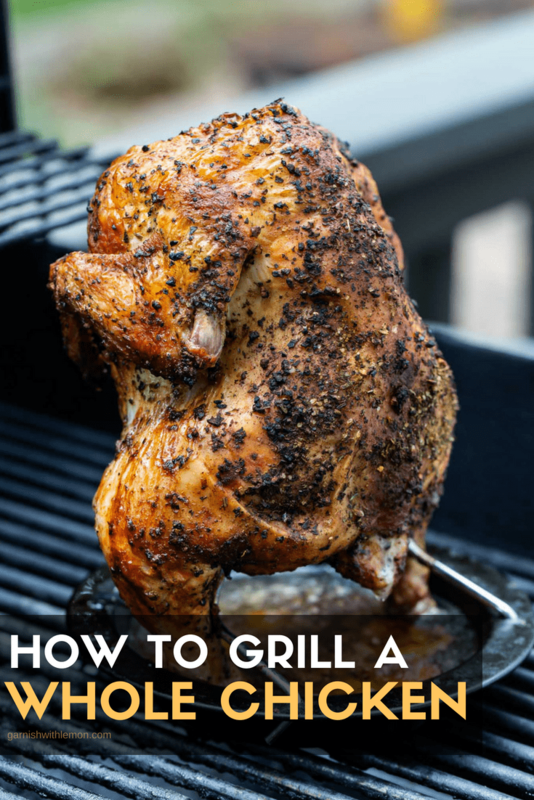 Lately, our grilling game has been focused on adding variety to our typical burger and brat rotation and experimenting with other main courses, like whole chickens, and we compiled all of our tips for you in this handy guide to How to Grill a Whole Chicken. A grilled whole chicken is pretty much the perfect summer outdoor meal. No oven is required, so the house stays cool, and this recipe for How to Grill a Whole Chicken is pretty much hands-off besides a few minutes of prep work. The result? 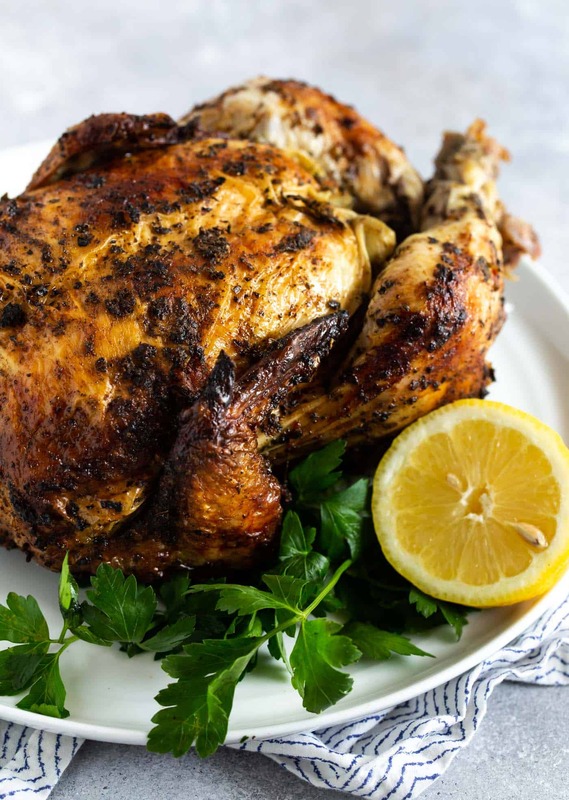 A gorgeous roasted bird with crispy, crackly skin and perfectly juicy white and dark meat. We get it; grilling a whole chicken can be intimidating. But if you’ve roasted a chicken in the oven (or even if you haven’t), you can definitely grill a whole chicken. The first step is to start with a quality chicken. We love Gold’n Plump® Whole Chickens because they are raised on family farms right here in Minnesota and Wisconsin. 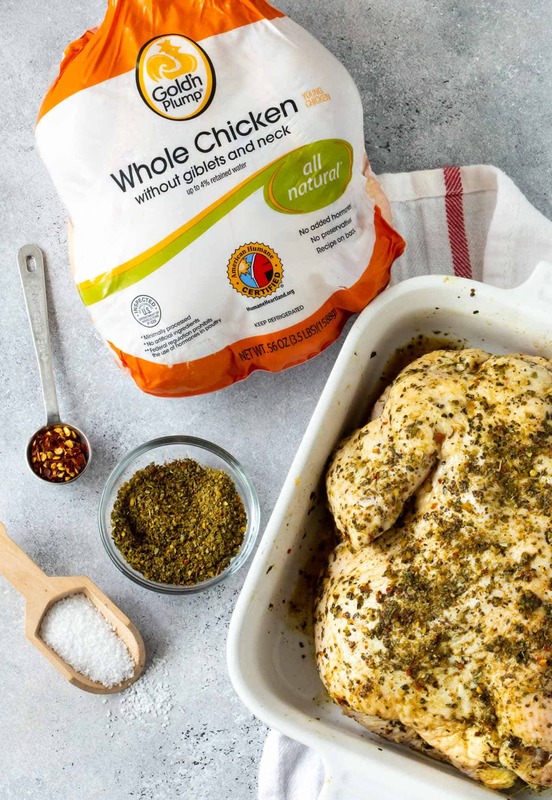 Their chicken products have no added hormones, no artificial ingredients, no preservatives and are hand-trimmed and ready-to-use straight from the package. Quality and convenience like that can’t be beat! Next up is grilling technique. 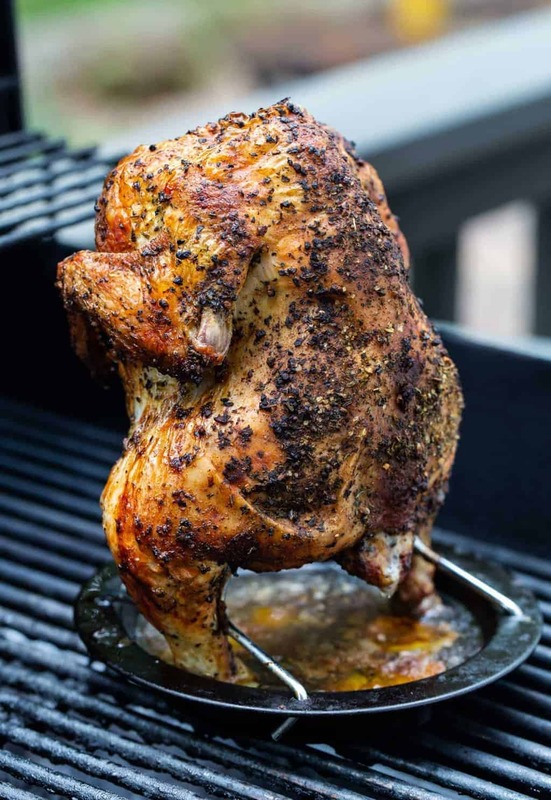 You can certainly grill a whole bird right on the grates, but we’ve found that using a vertical roaster yields more even results (especially when we are busy chatting on the patio and forget to check the chicken!). We have a vertical roaster that we use and love. It’s not a super expensive kitchen tool to buy, especially if you do as much grilling as we do. But if you don’t have a vertical roaster or don’t want to purchase one, you can still vertically roast a whole chicken using either a Bundt cake pan or tall beer or soda can. The idea is to keep the bird upright and allow air to enter the cavity of the chicken so the meat can cook evenly. Our tutorial is based on using a gas grill, but the same concept works on a charcoal grill. Basically you want to get your grill hot and then create dual zones on the grill for the chicken to slowly roast – one hot and one cool. You can do this by either turning off a burner on a gas grill or moving the chicken to a cooler spot on a charcoal grill. When you’re ready to grill, you have a couple options for seasoning your bird: a dry rub or a wet marinade. We usually reach for a dry rub as our summer meals often come together last minute, but if you plan ahead, a leisurely soak in your favorite marinade for a few hours will give your whole chicken excellent flavor, too. There are no hard and fast rules for flavoring here. Have a go-to BBQ rub that you put on everything? Add it to your chicken! Or whip up a homemade marinade with lemon juice, olive oil, rosemary and garlic. Short on time? Feel free to grab a bottle of Italian salad dressing and use that as your marinade instead. How do I know if my whole grilled chicken is done? A 3 1/2 pound whole chicken takes about 75 minutes when cooked over medium heat on my gas grill. You can double check to see if your grilled whole chicken is done by inserting a thermometer into the thick part of the thigh being careful to avoid the bone. (This instant-read thermometer is our favorite. Quick and accurate every time!) You’re looking for temps between 160-165 degrees, as the chicken will continue to cook once it’s removed from the grill. Don’t have a thermometer? Make a small slice in between the breast and leg and check the color of the juices. If they run clear, your chicken is done. Keep your chicken on the grill for a bit longer if your juices have a pink tint to them. When the weather heats up, no one wants to be inside hovering near the oven for dinner. Follow our tips for How to Grill a Whole Chicken and you’ll see that grilling a whole bird is just as easy as roasting it in the oven (plus air conditioning becomes totally optional). Disclosure: This post was sponsored by Gold’n Plump®. We only share products with you that we personally use and love. Thanks for supporting the brands that make Garnish with Lemon possible. Preheat grill to medium hot heat. Remove chicken from packaging and pat dry. Combine oil and seasoning mix in a small bowl. Rub seasoning mixture all over chicken, even inside the cavity. Place upright on a vertical roaster (legs at the bottom). Turn off one grill burner and place chicken there. Reduce heat to medium on remaining burner(s) to maintain a constant heat of about 350-375 degrees. Grill for 75 minutes or until done, carefully remove from grill and allow to rest for 15 minutes before serving. Thank you so much for this recipe. I just attempted my first whole chicken on my gas grill, and your post was a great guide. 75 minutes was just perfect for my grill as well. The skin was perfectly crispy and the meat very moist. No more oven or crockpot chickens in this house! Love it, Angelle! Thanks for stopping back to let us know how well it worked for you! Wow it just look so amazing, delicious and juice! I can’t wait to try it. Thank for sharing.